A lot of people don’t realize that the needs of a senior cat can be drastically different from the needs of a younger cat. Unless you are experienced in the changing health demands of a cat as it gets older, you will likely rely on the advice of your veterinarian at the local animal hospital in Dartmouth. Here you can receive quality vet care for cats and dogs of any age, as well as pocket and certain exotic pets. Our team is highly educated and experienced with a number of essential treatment options for senior pets, including pain management and feline dental care. In fact, we offer advanced dentistry in Dartmouth for a wide variety of pets. 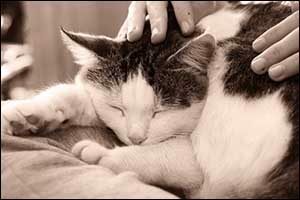 Pets age more rapidly than humans. As a result, cats that are over the age of seven years are considered to be seniors. With proper care and nutrition, cats can live to be much older, depending on lifestyle and a number of other factors. Changes in your cat’s body occur, just as they do in people, with approximately 90 percent of cats over the age of 12 experiencing arthritis to some degree. Arthritis can cause pain and issues with mobility, resulting in cats that are slower and less active than they were in their youth. Cats are often less likely to jump up on cat towers, countertops and furniture, due to arthritic pain. Feline dental care is a bigger issue than most people realize, as well, with a large percentage of cats already experiencing dental disease by the age of three. Advanced dentistry in Dartmouth is available to help prevent the progression of dental disease, which can cause teeth to fall out or make it painful to eat. This type of pain can cause pets to lose weight or stop grooming. If your senior cat is experiencing weight loss, there are a number of issues that should be considered. Regular veterinary check-ups can identify most problems, such as liver disease, heart disease, kidney disease, thyroid disease and other serious conditions. As a pet owner, there are certain risks that you need to keep an eye out for with a senior pet. Weight loss, as we have established, is an important indicator of health risks. However, weight gain is also a serious issue. As cats become less active, they can gain weight. Obesity is a problem that can affect cats of all ages, which can lead to your cat becoming diabetic or having even more issues with arthritis and mobility as she ages. Once again, regular veterinary check-ups can help to keep it all under control. Schedule annual visits to Anchor Animal Hospital in Dartmouth to receive vet care for cats and dogs, unless your veterinarian wants you to come in more frequently due to health issues. Speak with your veterinarian about special diets that can help to overcome specific diseases and conditions, including heart or kidney disease. Diets that are lower in sodium can be beneficial for cats that have been diagnosed with heart disease. Diets with restricted iodine levels can be beneficial for cats with overactive thyroid glands and diets high in phosphorous can be beneficial to cats with kidney disease. Cats of all ages should receive annual check-ups, but if it has been awhile since your senior cat has been to the vet, you should give us a call. Vet care for cats and dogs is extremely important as they age, helping to prevent issues regarding pain, mobility and overall health. Give us a call at 508-996-3731 to schedule a check-up or to learn more about the services available regarding advanced dentistry in Dartmouth or emergency veterinary care.